Last night, while going to bed, Ed and I decided that today would be a Love Bomb Day! We would be love bombing Brian - giving him individual attention from both of us. AND - we'd be celebrating Miss Hope, who turned three months! Here are some photos from photo shoot. Hope and I had fun playing dress up while Daddy and Brian were out having a great time at Arnold's Family Fun Center. 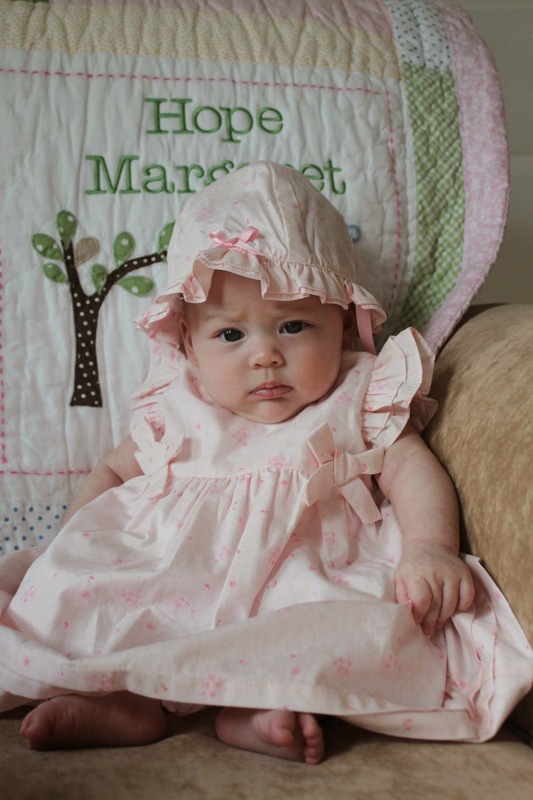 This adorable dress that came with the bonnet and bloomers was gifted to Hope by very dear family friends that I lived next door to growing up. My Mom saw this photo of Hope and thought she was looking at me! I'm sad that we're already three months into our relationship with Hope, but excited at the same time to see what this month has in store for us! I think she's taking three months very seriously. But... Hope is the sweetest, most pleasant little girl. She has an easy smile and a relaxed attitude - unless, of course, you are strapping her into a car seat. Of course, I would be annoyed too if I was pulled out of my warm comfy bed during a nap to take me out into the frigid winter cold several times a day - car seat or not!! She makes cooing and gurgling and making semi-giggling sounds all the time now. Music to our ears! And she's even putting herself on a schedule of sorts. She naps twice a day and is starting to go down at a typical bedtime - around eight or so. She's up at midnight or one, on average, and then one more time around five. BUT... there have been a few times, like last night, that she slept for six hours! Every so often - still - Ed and I look at each other and can't believe our life. We feel so blessed to have a daughter. And even luckier that Brian adores her as much as he does. The feeling is mutual. Now that Hope is more alert - she watches Brian everywhere he goes! When Brian talks to her, he uses his "cutesie" little voice and calls her "pumpkin" or "sweetie pie" or "Hopi-doo." It chokes me up every single time, it's so sweet. Happy three months, Hopi Doo! Granny came over this afternoon! Her intention was to stay with Hope so Brian and I could go on a date. I was going to take him to the Lego movie! But he decided he would rather stay home and play with the two of us!! As it turned out, Hope took a long afternoon nap so Brian had us all to himself. We did arts and crafts, read some books, he built some block towers with Granny - it was a fun afternoon. Then - to continue the "family love bombing" - Aunt Bean, Shannon and Claire came for a visit! Shannon and Claire were rock stars - running around with Brian, having light saber fights, playing with super balls and cars. Brian had so much fun! And Hope loved bonding with her Aunt. I think ALL of us felt love bombed today. I love my little family... and my big family. I used to nanny for boys around Brian's age, and they loved the Froggy books. When we were introduced to his sister, Pollywogalina, they started to add "wogalina" to the end of everyone's names. Happy 3 months Hopiwogalina! I just caught a rerun of the "little couple". Jen and Bill both have a form of dwarfism and have adopted two children with dwarfism. In the episode I am watching they took their son Will to Dupont because they have a great pediatric program for children with dwarfism. Have you thought of contacting Bill and Jen to get them involved with donations and fundraising? It seems like something they could really raise awareness for. What a beautiful strong loving family you have!! I am a new mom to a four month old boy and just an enamored by your strength! What a beautiful, strong, loving family you have! As a new mom to a four month old son, I enamored by your strength! May I ask what camera you use? You are so great behind the lens!! The lighting always looks natural even when indoors! Do you use a flash cause it never looks like you do! I have a Canon rebel and I use an external flash with a diffuser cap. I may have made up the term "diffuser cap." It's like the flash has a plastic cap that acts as a filter. That camera and the flash was the best gift Ed ever gave me next to my wedding rings.